Burke Franklin on the Contactor’s Corner radio show! Expert Support from a Contractor’s Contractor! Since 1999, Construction Programs & Results, Inc. (MarkupAndProfit.com) has helped thousands of general and specialty contractors of all types build stronger, more profitable businesses. We offer business management assistance to construction-related companies in the U.S. and Canada (and 23 other countries so far), with books and training programs available on our website. We also provide coaching, consulting and expert witness services. Michael Stone is a graduate of Eastern Oregon University, with a degree in Business & Construction Management and Computer Science. His expertise lies in business management solutions and computer software programs for the residential construction industry. Michael’s book, Markup and Profit; A Contractor’s Guide (1998) and the revised edition, Markup and Profit; A Contractor’s Guide Revisited (2012) focus on the subject of overhead and profit margins for the residential and light commercial construction industry. This best selling business management book is considered an industry standard and is used by construction associations and educational providers in many states to teach the fundamentals of overhead and profit margins, and business management to general and specialty contractors of all types. His 30+ years of experience in residential remodeling and specialty sales is shared in his book, Profitable Sales, A Contractor’s Guide. Primarily for residential construction sales, Michael addresses how to prepare for a sales call, how to conduct a sales call, how to be a salesperson and how to employ a salesperson. Solves Multiple Problems at Once! Writes a professional business plan for your construction business quickly and efficiently. Whether you’re looking for a loan to buy more trucks or to finance a project, use BizPlanBuilder to think it through and present a compelling proposal to your bank or investors. Its organized system of sample business plan templates, flexible financial models, PowerPoint presentation template can be accessed 24/7 online. Using BizPlanBuilder is the fastest and easiest way of turning your ideas into a compelling business plan and a successful business. It’s been proven with banks, SBA lenders, and angel investors worldwide with more financing successes than any other. With personnel records kept in one centralized system, multiple authorized users can gain instant access to the information they need, when they need it. 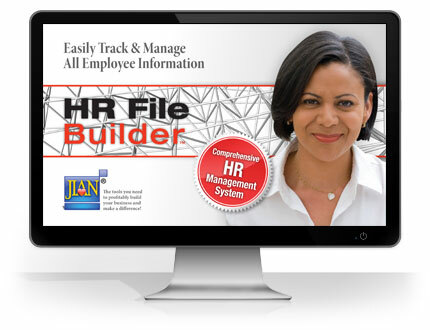 Evaluating employee performance, making recommendations, preparing reports, and backing up personnel decisions and policies has never been easier. In the event personnel or legal problems ever develop, you can be confident of having the necessary records and documentation to back you up. OSHA Injury & Illness Prevention Training system publishes a written safety manual — Keeps OSHA out of your wallet! 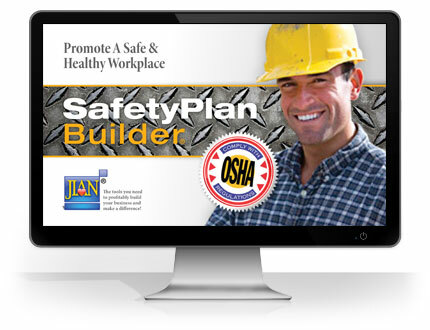 Safety Plan Builder software helps you publish a custom illness and injury prevention manual to quickly and easily comply with OSHA, avoid lawsuits, train your employees, and provide a safe workplace. Covers 161 Safe Work Practice categories. All elements of your safety plan are pre-written. Select the appropriate sections for your business or industry, then customize the paragraphs. Menus help you select the paragraphs appropriate to your state. Contains over 250 pre-written pages of industry-specific Safe Work Practices — and we keep it up to date for you. Now you can publish your complete safety handbook in a few minutes and be compliant in all 50 states. In the construction business, you have all kinds of people working for you… And it;s crucial that you establish your HR policies and publish a comprehensive policy handbook to keep them in line. Developed with HR Experts, successful entrepreneurs, and psychologists (+ we are a member of SHRM), this personnel policy manual provides excellent management training, ensures that employees are treated fairly and protects you from lawsuits and the labor board! Comments throughout explain issues and give direction. 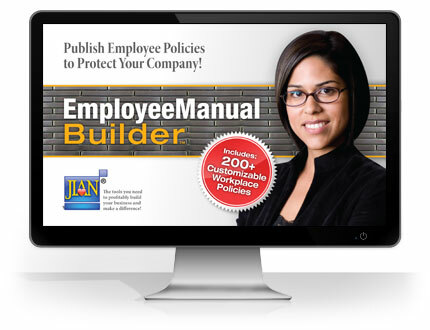 Includes everything you need to plan, develop & implement your employee policies and produce a comprehensive employee office policy handbook. 24/7 secure access online — and we keep it up to date for you. Now you can solve / prevent a bunch of problems all at once!